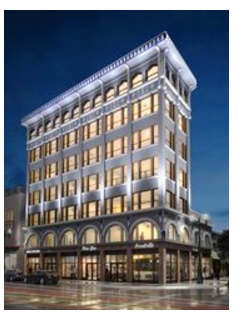 ​​EL PASO – A group of young El Paso investors has purchased the 106-year-old, seven-story Abdou building in Downtown, adding to the rejuvenation of the city's center in hopes of getting more El Paso expatriates to return home. The group completed purchase of the historic 25,000-sf building at 115 N. Mesa and Texas—for sale for $1.85 million and appraised for tax purposes at $407,118 by the El Paso Central Appraisal District. The group plans to first have the exterior repaired, painted gray and new lighting added. The Abdou building has eight apartments and three ground-floor retail spaces, one of which is vacant and for lease. Plans are to keep apartments on the second through fourth floors, and turn the upper three floors into office spaces.